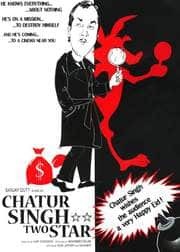 If Sanjay Dutt thought he could pull off an Inspector Jacques Clouseau act from the hilarious Pink Panther series in this movie he has failed miserably. Sure, he has the razor thin moustache that Peter Sellers sports but nothing else in terms of plot or acting to match that legendary hero. I don't know if I should waste my time on the story. There is Inspector Chatur Singh, a detective, a sidekick (Suresh Menon trying hard to be funny) a maniacal Police Chief, his sidekick,an innocent heroine, assorted gangsters,diamonds and lots of wierdcostumes and get ups. Enough said. Sanjay Dutt looks too old and haggard to begin with. Then the grimaces and faces he makes will scare even his infant twins. Amisha Patel makes her presence, I mean her body, felt in skimpy clothes. Anupam Kherson deserves a Filmfare Award for looking serious in a bunny costume. Satish Kaushik acts like a taxi, Shakti Kapoor as a don and Gulshan Grover as a lecherous politician. Stop reading right now and thank me for wasting my time so I could save yours. I am doing this job for the country.